While you’ve spent most of February brushing up on your camel spins, hat tricks, axels, and blueliners, we’ve been listlessly counting down the days until the closing ceremony of the Winter Olympics, angry-eating snack food, and watching upcoming episodes of all your favorite shows, crushed by the knowledge we can’t talk about them … until now. Thankfully, this Olympics madness is almost over. 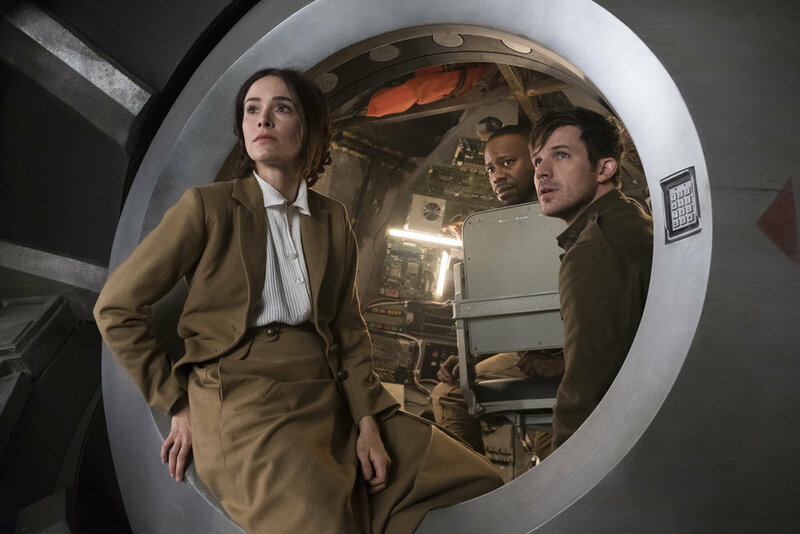 The primetime mid-season schedule is just around the corner, and with a slew of shows making their return over the last week of February and early March, there’s a lot to look forward to. 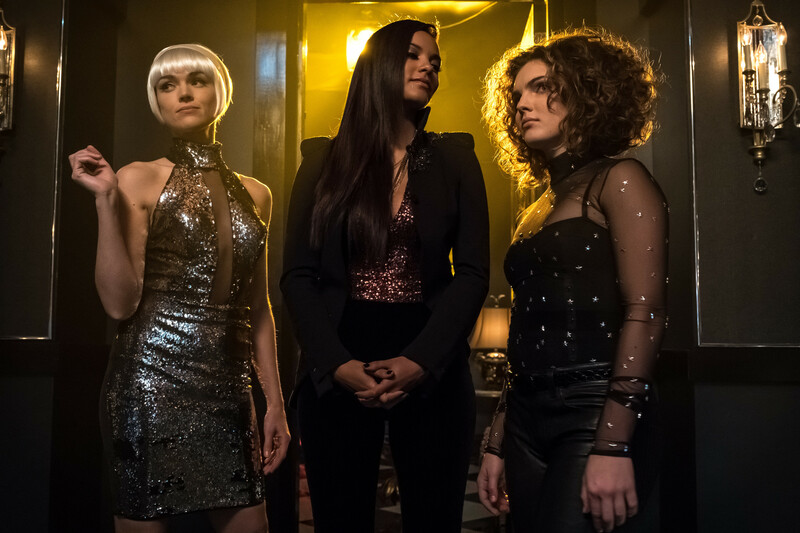 On our watchlist today is Gotham’s mid-season return, Shadowhunters’ season 3 premiere, and fan fave Timeless, un-cancelled and shortly returning for season 2. Read on for some exclusive scoop on these upcoming shows. NEW BEGINNINGS | Gotham Returns on Thursday, March 1 (8:00-9:00 PM ET/PT) with a Spring Premiere titled “A Dark Knight: Pieces of a Broken Mirror,” which is a subtle nod to a big reveal in the episode’s final moments we won’t spoil for you here. Although recent teaser trailers from FOX have heavily leaned into the Joker’s origin story, Cameron Monaghan’s mirth-filled trickster is disappointingly nowhere to be seen in the premiere. However, the hour is filled with several other new beginnings that could, if you squint just right, be seen as origin stories, so there’s that. Look out for yet another new look for Poison Ivy, as Peyton List takes over the role from Clare Foley and Maggie Geha. (She keeps the stripy sweater, guys!). Meanwhile, Doc Lee Thompson takes on a new role as motivational speaker — encouraging the Narrows’ great unwashed to stop drinking, lounging about watching violent bloodsports. Oh and killing each other. The Doc’s words send a powerful message to the populace, and in doing so, incur the wrath of someone who’d rather she stop. Permanently. And as the show struggles to give Barbara Kean, Selina Kyle and Tabitha Galavan something noteworthy to do (but then changes its mind and throws them together in a nightclub for more wigs and sassy talk) Butch makes contact with Tabi to discuss his Grundiness — and the fact he now remembers Barbara Kean shot him in the head. Meanwhile, Bruce continues to be a douche, Gordon starts to take on the exhausted look of the only sober person in the bar at 3 am, and Alfred, down on his luck, tries to eke out a new living in the Narrows, but is soon set up for a murder he didn’t commit. All that, and a new Gotham villain called the Toy Maker too! RELATED | New Gotham Trailer — Is You Is, Or Is You Ain’t My Joker? COMING CLEAN | It seems that just about everyone is struggling with how much to reveal when Shadowhunters returns for a third season premiere on March 20, at 8 pm on Freeform. Following Valentine’s demise at Clary’s hands, greater demon Lilith is stepping up to the plate as this season’s Big Bad. We’ll also get to see sparks fly a little later in the season with the introduction of Simon’s new roommate Jordan Kyle (The 100‘s Chai Hansen) and Magnus’ warlock rival Lorenzo Rey (Hamilton‘s Javier Muñoz). It seems Lilith has big plans, not only for ‘son’ Jonathan, whose body she snurches in the opening moments, but for all those wraith demons let loose following Jace’s resurrection last season. All we can say is watch out, New York! But it’s not all doom and gloom. Look out for a special rune ceremony for Clary, who officially becomes a Shadowhunter this season. Along with an angelic new rune, Clary finally gets to choose her weapon(s) — or rather, as Luke points out, her weapons choose her. And yeah guys, it’s kinda poignant, and stuff. Meanwhile, Luke is in hot water with Ollie, who reveals that she was bitten, but unturned, by a werewolf in her past. As Luke well knows, revealing the supernatural to Mundanes never leads to anything good. However, when Ollie starts seeing things Luke can’t brush off, he will be forced to reconsider what to tell his perpetually snoopy partner. And while Alec is full of questions about why his Parabatai rune disappeared that time Jace was killed impaled, both Jace and Clary remain convinced that keeping the secret about Clary’s big resurrection wish is the best course of action. However, for Jace, keeping recent events under wraps may prove impossible. Meanwhile, Simon joins prestigious ranks — along with David Bowie — of musicians who have been forced to serenade the court in Seelie-ville. And while he’s still not quite sure what the Seelie Queen really wants with him, he will find a way to return home to Maia. But not before the Queen impresses something of great importance upon him. Literally. And last but by no means least, Magnus and Alec find themselves in strange waters when work, not misunderstandings, threaten to keep them apart. On the brink of accepting a position on the High Council, Alec learns that Magnus is no longer the High Warlock. And while Magnus appears to be happy with that decision, and happier still working (for money) with clients again, and even happier yet (if you can believe it) with Alec’s offer, Alec begins to suspect his boyfriend is not being as emotionally honest as he could be. Bring on the Martinis and the frank talk, boys! 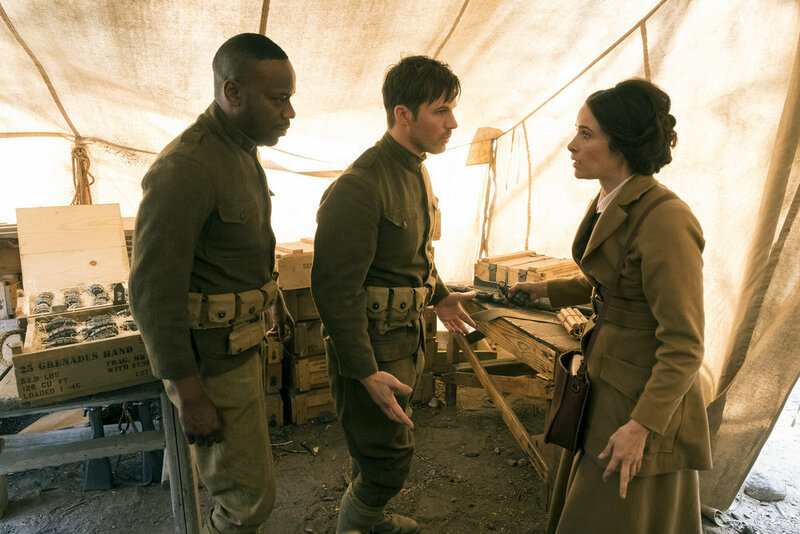 The season premiere “The War to End All Wars” (airing Sunday March 11 at 10/9c on NBC) will see a distraught (see also scarred and brooding) Wyatt tortured by his desire to find Lucy, following an explosion at Mason Industries that effectively wiped out everyone on the project. However, Agent Christopher is determined that neither he nor Rufus should set out gung-ho, get caught, and accidentally reveal their secret underground bunker location to Rittenhouse, and so Wyatt is left to brood, count off the days until the Lifeboat is repaired, and miss Lucy terribly. Meanwhile, Lucy, assuming her friends are dead, has been drafted into the odious organization that Rufus describes as “a cross between Hunger Games and Handmaid’s Tale,” and finds herself on a new mission, accompanied by her mother and the sketchy Emma on a trip through time to World War 1. Oddly enough their mission involves saving a life, rather than taking one in typical Rittenhouse style. However that doesn’t stop Emma demanding Lucy prove her loyalty in the most cruel way — a test you may be horrified to see Lucy pass. Watch for a moment in which Rufus prompts Wyatt to admit he’s in love with Lucy, and another in which Lucy has a fangasm upon meeting two-time Nobel prize winner Marie Curie. Oh and if you thought Garcia Flynn is sitting this season out, think again. Follow our official Twitter @ScreenSpy for more exclusive scoop and interviews on these and other primetime shows this season.